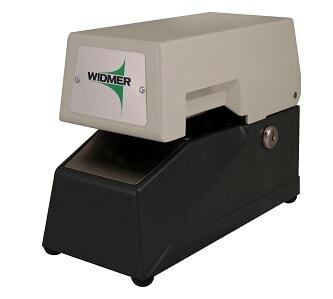 The Widmer DN-3 Date and Numbering Stamp has 6 digit consecutive action number plus a manually set month - date and year in addition to the features of the Model D-3 . It is a very fast and efficient machine for dating and numbering invoices, purchase orders and documents of all types. Eliminates the need for pre-numbered forms - and is a versatile and economical way to control your paperwork flow. Consecutive action will advance with each stamping. Available with either consecutive - duplicate - triplicate or quadruplicate action (but not a combination of these). Any combination of number - letter and dash wheels up to 11 wheels. The Model DN-3 can be furnished with repeat switch and guide platforms available for special print locations.